Organic whole wheat toast, coated with a generous layer of Reese Spread. A study in contradictions. In my early years, I grew up in a household where granola was made at home, sugar was largely shunned and healthy homemade meals were the rule, not the exception. Until I started elementary school, I assumed this was normal, and that all other parents cared equally about nutrition and eating right. Imagine my wonder when I caught wind of the packed sandwiches two of my Winnipeg schoolmates brought from home: one regularly ate butter-and-sugar sandwiches, while another brought two slices of white bread with a layer of melted chocolate smeared inside. Part of me was scandalized, even in Grade 1, that any parent could be so wildly irresponsible. And another part of me was more than a little curious about what chocolate smeared on bread would taste like. Not like granola, certainly. As I grew up, I puzzled out that the chocolate in those sandwiches was likely Nutella, which was not on my radar at the time. Even as an adult, I’m not really a fan. I find the taste of the hazelnuts overpowers the chocolate, and the heavy-handed sweetness is beyond cloying. Yeah, it’s OK on some crepes with strawberries and bananas, but I can’t be bothered to keep some in the pantry to spread on a slice of toast. As much as I don’t like the hazelnut-chocolate combo, the peanut-chocolate duo is one of my longstanding favourites. Witness the various Reese products I’ve reviewed on this site over the years. 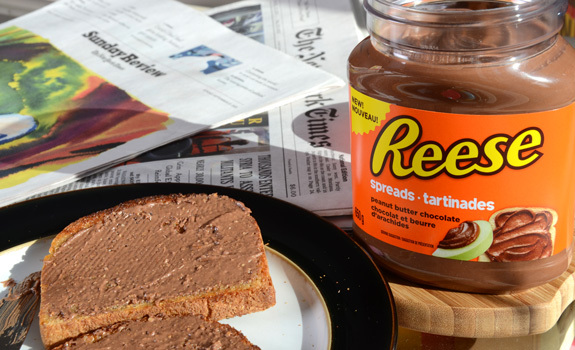 As much as this new-to-Canada Reese spread caught my eye, I didn’t initially pick up a jar due to my ho-hum view of Nutella. When a jar was gifted to me, I knew it was time to try it. First off, it’s leaps and bounds better then Nutella. Yes, it’s intensely sweet, but there’s a touch of salt in there to counter the sweetness and make it less one-dimensional. The texture is also oddly interesting, with the same sort of grainy, mushy texture of Reese peanut butter cups instead of a smooth, slick spread. The flavour is unmistakably Reese, which is what I’d hoped for – but it’s also not suited for everything. I liked it on a slice of buttered toast, but I couldn’t manage much of it on a spoon – it was too sweet for that. I could see this being an awesome dip for fruit (chocolate fondue style, minus the flames and stuff), a crepe topping or an alternative to regular peanut butter in a sandwich. But I wouldn’t pack it for a school lunch. Because #parenting. Value for cash money: OK, sort of. In line with Nutella prices at the same Safeway, which is the natural comparison. Nutrition? : Per 1 tbsp (19 g): 100 calories, 6 grams fat, 75 mg sodium, 1 gram fibre and 2 grams protein. Also: 10 grams sugars. It’s sweeeeeeet. The verdict: Awesome. While it’s too sweet to eat on a spoon, you don’t need a thick layer on bread to get the desired effect. I’m just about done the donated jar, and purchased another so I wouldn’t have to be without it. We’ve discovered that spooning this over vanilla ice cream also makes for a delicious treat!